If a child is to keep alive his inborn sense of wonder… he needs the companionship of at least one adult who can share it, rediscovering with him the joy, excitement and mystery of the world we live in. 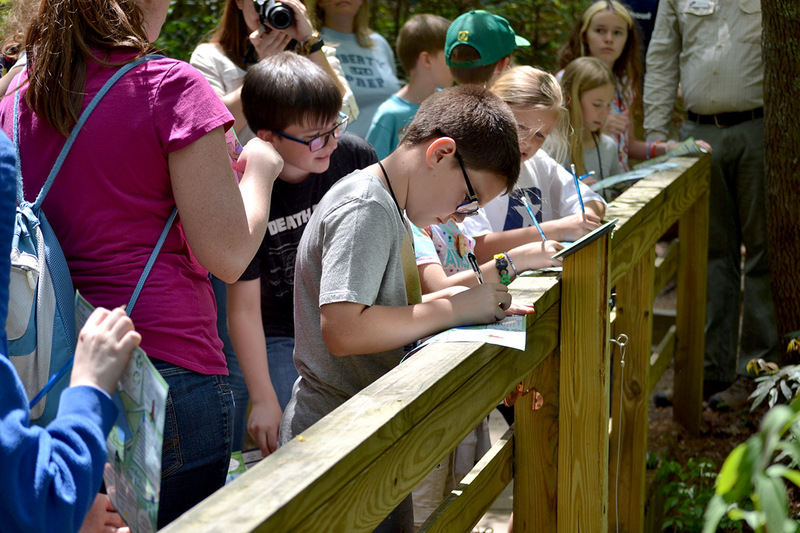 Getting kids to fall in love with being in nature is a major part of what the Kids in Parks program’s TRACK Trails are all about. However, it is important to remember that it is just as easy to make your child dislike nature as it is to make your child love nature. Here are some important tips and suggestions that can help you ensure your child has an adventure in nature that will foster a desire to return. When you are planning to take your child/children on a hike it is important to remember that the hike is for them, and not you. Although adults may enjoy a fast paced long hike with tons of elevation gain and loss while bagging multiple peaks, a hike like this will only spoil the experience for the child. Instead, follow some of the tips below when planning your outdoor adventure. You may not make it to your planned destination: that inspiring overlook or amazing waterfall; you may not even make it a half a mile, but that does not mean the hike can’t be packed full of adventure. Be prepared to modify your hike based on the comfort level of the children. If you do, next time they’ll be excited to make it to that special spot. If you don’t, they may not want there to be a “next time”. Choose a short trail with minimal elevation gain and loss, lots of things to do and see, and one that is safe… Chose a TRACK Trail. However, remember that even if you chose the right trail, you may need to modify your plans to meet the needs of children. All the proper planning in the world won’t help if children aren’t dressed properly. As soon as a child becomes uncomfortable, his or her enjoyment will stop. Maximize the enjoyment by wearing appropriate clothing for the weather, and be prepared for the weather to change. Also, proper footwear is important. Kids in Parks staff have seen more than one pair of flip-flops destroyed on the trail, with the owner hobbling back to the trailhead with one flip-flop in hand and the other on foot. Kids don’t need to wear hiking boots, but close-toed sturdy shoes are helpful. The first time you go for a hike, go for a short one. Leave children wanting more – not exhausted. A child 5-7 years old can walk ½ a mile comfortably. Even though the hike may not be long in terms of distance, there are plenty of things that can be done to make the hike as adventurous as possible. You will have a successful hike with your children if you can make it an adventure filled with discoveries. Since children find almost everything in nature to be an adventure, you won’t have to go too down the trail to make it happen. Discoveries can be found all over the trail. Brush leaves out of the way and look for insects, watch pollinators interact with flowers, touch the bark of various trees, listen to the calls of birds, etc… There is no limit to the amount of things that can be discovered in nature. To help with the exploration, bring a kids guidebook or magnifying glass. Most importantly, let children share their discoveries with you as you share discoveries with them. Encounters with nature can be extremely educational and meaningful. Make sure you take time to observe. From watching a centipede cross the trail to learning the names of trees based on the bark, connections to nature can be made through observation. Kids can find an adventure in everything – a stick, a rock, a bird, a bug, etc… Even though they may stop every two seconds to look at the next coolest thing they ever saw, be patient. Being patient and getting excited about what they are excited about will only aid in their desire for more encounters in nature. While walking a mile or two may not seem that far to adults, to little kids – depending on age and experience – it can be too far. Remember, their little legs don’t cover as much ground per step as ours. Let them set the pace and guide their journey. Make the first hike short in distance, but long in adventure. As soon as kids get tired, their experience and joy begins to diminish. To prevent them from getting tired, take rest stops before they are needed; and, compliment them about what a great job they’re doing before they begin to complain about the distance walked or the steepness of a hill. Here are some other tips and tricks to make sure the hike is as meaningful as possible. While it is always a great experience to spend time in nature alone with your children, sometimes bringing one of their friends along will make their trip more fun. Playing with friends, children can take their discovery experience to new levels. Plus, it is a great way to introduce other children to nature. Adventures in nature are more fun if it is a game. Develop checklists along the trail to aid in the discovery. Examples would be counting the number of mushrooms you find, the number of birds you hear or the number of different types of trees you see. Or, you could simply pick up a TRACK Trail brochure and use it to guide the exploration. Keep kids interested with activities along the trail. Play games, count, touch, listen, smell and taste (if you know what you’re tasting). The more senses you engage, the richer the experience will be for you and your kids. If you’re not having fun, then your kids won’t be having fun. If you’re not going to enjoy walking one mile, they are not going to enjoy walking one mile. The Kids in Parks staff has been on more than one hike where the parent, teacher or chaperone was less than enthused about the distance of the trail, and that enthusiasm had an extremely negative impact on the children’s experiences. Kids are the masters of reading body language; don’t spoil the fun by sending the wrong signals. There are innumerable places where the careless step will be the last step; and a rock falling from the cliffs may crush without warning like lightning from the sky; but what then? Accidents in the mountains are less common than in the lowlands… Few places in this world are more dangerous than home. Fear not, therefore, to try these mountain-passes. They will kill care, save you from deadly apathy, set you free, and call forth every faculty into vigorous, enthusiastic action. There is inherent danger in anything we do, from driving a car, to walking across a street, to playing basketball… nature is no different. Kids in Parks wants you to be safe when adventuring outdoors. Here are some tips to help you and your family have a safer nature experience. Obviously, we want our kid’s experiences in nature to be filled with fun and excitement… letting them have the freedom to explore and learn through direct experience. However, just as in any situation, keeping kids close is the best practice for safety. Poison-ivy, wildlife, road crossings, and strangers are always best dealt with in a group situation with adults around. Staying on the trail is the safest, easiest, and most considerate way to experience the resource. The trail surface most often provides the sturdiest footing and minimizes the potential for encounters with poison-ivy, dangerous insects and venomous snakes. The trail also provides the easiest way to navigate through thick forest vegetation and concentrates use in one area, thus protecting fragile vegetation from being trampled. For approximately 85% of the population, safety in the woods means avoiding poison-ivy. Poison-ivy is a woody vine that produces an oil called urishiol on its stems and leaves. For many, urishiol is a skin irritant that causes an itchy rash. In general, staying on the trail is a good way to avoid poison-ivy. However, since poison-ivy grows on the fringe of many hiking trails, knowing how to identify it is the best way to avoid contact. Note: The outer two leaflets are notched on their outer edge while their inner edges are smooth, and the central leaflet is notched on both sides. Also, poison-ivy does not have any thorns on its stem. Remember, when we enter the woods we enter the homes of wildlife. Encounters with wildlife can be extremely special; and although you may have an interest in the animal, the animal probably has minimal interest in you. When you encounter wildlife on the trail, the best thing you can do to remain safe is to give the animal space to go about its business. 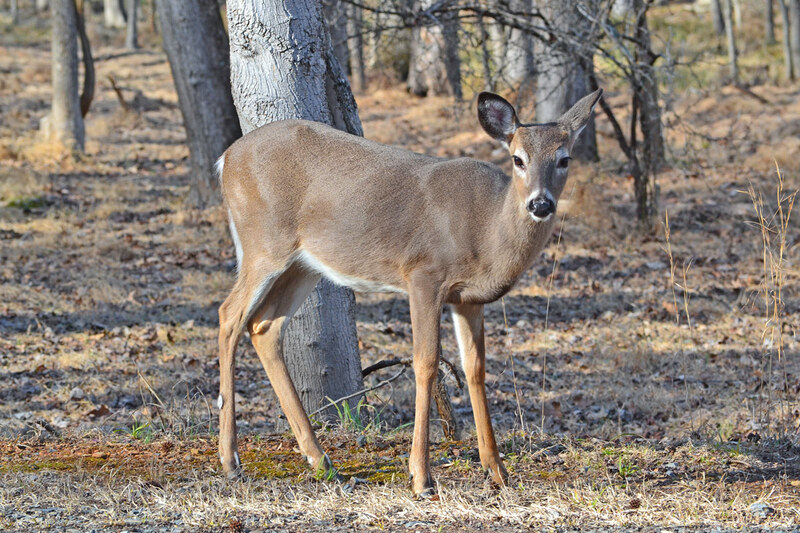 Consider yourself lucky to have had an encounter and remember that you are in the animal’s home – be respectful. Weather can change rapidly in the mountains. The best way to stay safe is to be prepared and pay attention. Be prepared by having adequate clothing for weather situations that could occur (i.e. in the summer, you don’t need to bring a snow jacket; but, thunderstorms are common so a rain jacket might be needed). As you journey down the trail, monitor the weather. Has the weather changed? Is a thunderstorm rolling in? If so, use your best judgment to determine if the weather is safe enough to continue or if it would be best to turn back. TRACK Trails are perfect for field trips and group outings. Schools and groups often visit our partnering TRACK Trails sites and utilize the self-guided brochures are a part of their trip. When considering the process of registering your entire class or group, please keep the following in mind: Kids in Parks would prefer that the kids register through their personal email account (or parent’s email account) as opposed to through the teacher’s / group leader’s email account due to the following reasons: 1) We would prefer to have the parent’s permission for the kids to be registered in the program; and 2) When the child graduates to another class, or wants to participate in the program outside of the group setting, they won’t have access to their account if their account is housed under a group email address that they do not have log-in information for. It is very difficult for Kids in Parks to separate accounts after the fact, so the child would have to start over if they wanted to continue participating in the Kids in Parks TRACK Trails program.